Thursday 29th November – Australian Market Wrap | Beeks Downunder-Because not all financial news is boring! Tomorrow is the last day of ‘Movember’….if you have donated there is still time! Doesn’t have to be to me …maybe someone else is doing it. ASX 200 up 33 to 5758 as rally fades. High 5779 Low 5737 Average volume. Adani to self-fund coal mine. Banks again firm but off highs. Miners back in favour on stable iron ore price. Energy mixed as WPL eases. Staples under a slight cloud. Building stocks find some friends. PME +8.55% growth stocks back in demand. ALU +8.59% strong rally. Was left behind. MYX -4.33% extreme volatility on AGM comments. BAL -4.32% disappointing AGM outlook. ALL -2.57% results come up lemons. COL -2.44% sell off continues. S32 +1.62% starting to bounce. FMG +2.28% investor day helping with iron ore price rises. MQG +1.54% leverage to US economy. PMV +0.60% AGM comments MYR tomorrow. Let the games begin. FXL +7.37% ACCC report helping sentiment. Speculative stock of the day: Manhattan Corp (MHC) +% high grade copper ever intersected at Joshua. Aristocrat Leisure (ALL) –2.57% Full-year results. Net profit after tax and before amortisation of acquired intangibles fell short of expectations at $729.6m. Revenue and EBITDA also came in just below forecasts at $3.55bn and $1.33bn respectively. A final dividend of 27c per share was declared (fully franked). ALL said it anticipates continued growth in FY19, and sees earnings skewed to the second half reflecting the timing of Digital game releases and corresponding UA investment. Bingo Industries (BIN) –5.29% ACCC raises concerns about BIN’s proposed acquisition of Dial-a-Dump. ACCC believe the acquisition would remove Bingo’s most substantial competitor for B&D waste processing, particularly in the Eastern Suburbs and inner Sydney. With few viable alternatives, prices are likely to increase. Mayne Pharma (MYX) –4.33% Trading update at AGM; year to date revenue of $183m, up 21% year-on-year. Gross profit a$108M, +75% y/y. Gross profit margin 59%. Rio Tinto (RIO) +1.74% has approved $2.6bn investment in Koodaideri iron ore mine. Koodaideri will deliver a new production hub for Rio Tinto’s iron ore business in the Pilbara, incorporating a processing plant and infrastructure including a 166-kilometre rail line connecting the mine to the existing network. Construction will start next year with first production expected in late 2021. Once complete, the mine will have an annual capacity of 43M tonnes, underpinning production of the Pilbara Blend, Rio Tinto’s flagship iron ore product. Orora (ORA) +3.16% To acquire Texas-based Pollock Packaging for $US80.5m. $US75.5m upfront and $US5m in instalments based on milestones. ORA expects approximately $6m in synergies over the next 2 to 3 years. Freedom Foods (FNP) +4.29% Outlook update at AGM. Capex program on track, with a large amount of expenditure committed in the first half. Sales and earnings are anticipated to lift on last year’s numbers and accelerate into the second half. Estia Health (EHE) +1.86% Reaffirms EBITDA guidance of mid-single digit growth at its AGM. IMF downgrades global growth ahead of G20 summit and that Dinner. 3.7% from 3.9% it forecast in July. The trend volume estimate for total new capital expenditure fell by 0.4% in the September quarter 2018 while the seasonally adjusted estimate fell by 0.5%. The trend volume estimate for buildings and structures fell by 1.6% in the September quarter 2018 while the seasonally adjusted estimate fell by 2.8%. The trend volume estimate for equipment, plant and machinery rose by 1.3% in the September quarter 2018 while the seasonally adjusted estimate rose by 2.2%. Trump has renewed its auto tariff threat. BOE doomsayer, Mark Carney, is predicting Armageddon if there is a hard Brexit. Peak iPhone? 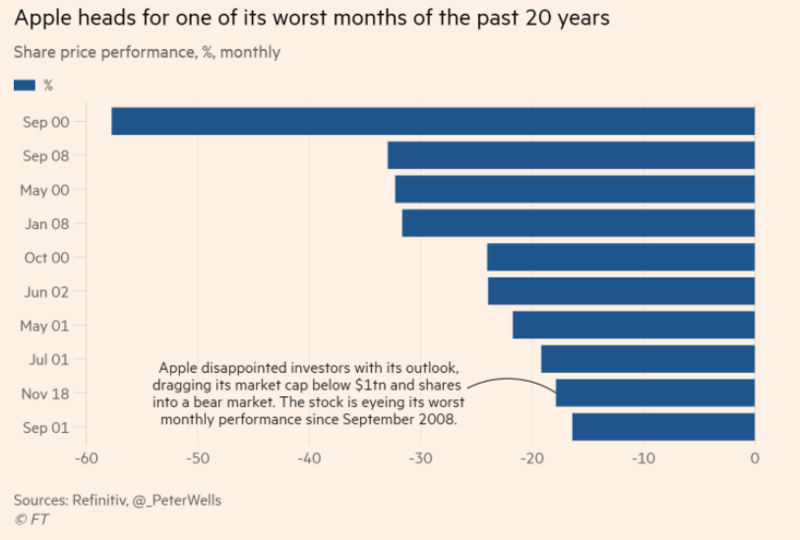 Apple has biggest monthly drop since 2008. What impact is the Netflix generation having on the iTunes store? Steve Mnuchin ‘untweeted’ this beauty after he said his account had been used by someone else. Maybe Harvey the white rabbit? Not happy Jan.